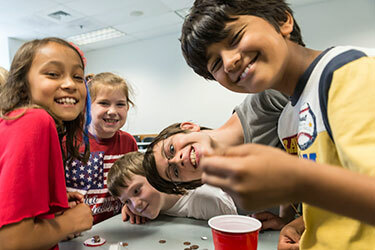 Kids on Campus (KOC) is a precollege program offered by the Office of Pre-College Programs at Wright State University for students in grades K through 6. On selected Saturdays, students can choose from a variety of hand-on courses designed for motivated students which serve to foster creativity and stimulate students’ thinking. Pre-College Programs has been providing academic enrichment programs for over 25 years on the campus of Wright State University. Join us for an exciting morning or afternoon of enriching, creative and hands-on programming. Bring your children to campus to experience unique classes and activities that will stimulate their minds. Description: Students will investigate the story of The Three little Pigs while they learn the importance of building homes and other structures out of strong materials. Students will look at different homes and their designs while using different materials to build their own miniature homes. Description: Bridges are used everyday. Students will investigate the different styles and designs of bridges, why we use them, and the materials used to construct them. Students will put their own engineering skills to the test when they build their own bridges. Description: How are skyscrapers made? Students will explore how these structures are built, the purposes of the different structures, materials used, and how they have evolved. Students will design and build their own towers out of a variety of fun materials. Students will divide up by grade levels where they will spend the first part of class learning and reviewing math skills they will need in order to complete the math race. Students will then travel around campus working together and individually to solve various math and logic puzzles. Please dress children in comfortable clothes and tennis shoes. Please note that most WSU buildings are connected by a tunnel system. In the event of inclement weather, students will utilize the tunnels to travel from place to place. Please note. Morning and Afternoon course sessions may be combined contingent upon program enrollment. Location: Once payment has been received, a link will be sent in an email with drop off and pick-up procedures. Classes are held in Allyn Hall. Registration: To register, please complete the online application process. Register early to be sure to receive your first class choice. Maximum registration for each course is 16 students. Confirmation: Confirmation letters will be sent to you by email. The confirmation packets will include, classroom number, a campus map, information on parking, and arrival and departure details. Parent Information: Parents will drop-off and pick-up their children at the appropriate classroom. Snack Break: Students in both the AM and PM sessions will be provided with a snack of goldfish crackers and a drink. If allergies are a concern with your child, please send a snack for you child and let the instructor know that you are providing a special snack due to allergies. For December only, students will have tea with milk and sugar and shortbread cookies. Permission Statement: The program participation statement on the Registration Form must be signed in order to process your child’s registration. Location: The Kids on Campus program is held on the main campus of Wright State University. Maps will be included in your confirmation materials which will be sent by e-mail. Inclement Weather: In the event of severe weather, please check your email and the Pre-College website for information. No refunds will be given if Wright State is open and students choose not to attend. Refund Policy: A cancelation fee of $15 will be deducted from refunds requested by parents for reasons other than closed classes or class cancelations. Refunds will not be issued to any participant who is dismissed from the program for disciplinary reasons. Refunds must be requested two weeks prior to the class date.